What type of Skip do I need? 4cu yd – popular for old bathroom & kitchen fitments, also good for medium amounts of waste from house renovations and garden renovations. 6cu yd – very popular for building waste such as concrete, bricks, blocks, stone and uncontaminated soil, but also a handy size for medium amounts of general builders waste. 8cu yd – a good choice for house clearances and often selected by builders for light waste. For lightweight materials only (e.g. timber, metal, cardboard, plastics) and where an enclosed container is required. 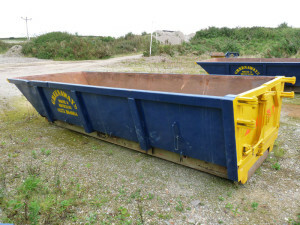 We also offer 3 types of enclosed skips, 8cu yd, 10 cu yd and 12 cu yd. 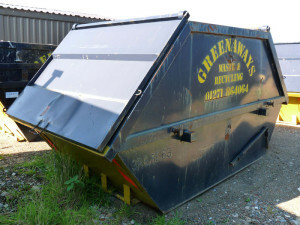 These skips are ideal for lightweight materials and where added security is necessary. 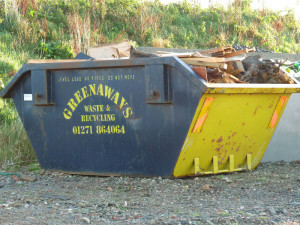 This type of skip has a bigger ‘footprint’ with door opening to the rear and is mainly used for heavy waste (e.g. concrete, bricks, blocks, stone and uncontaminated soil). In addition we also have a larger, enclosed container, with one large door opening to the rear. Ideal for secure temporary or long term storage. Capacity is as stated and physical size is an approximate overall measurement. Copyright © 2019 Greenaways Waste and Recycling. Powered by WordPress. Theme: Accelerate by ThemeGrill.